Kapa’a Auto Body was built on the commitment we have towards our customers and the passion we feel for the automotive and auto body industry. 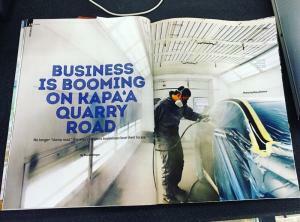 We are a tight knit family with several decades of automotive experience who manage the daily operations of Kapa’a Auto Body located in the town of Kailua, Oahu. 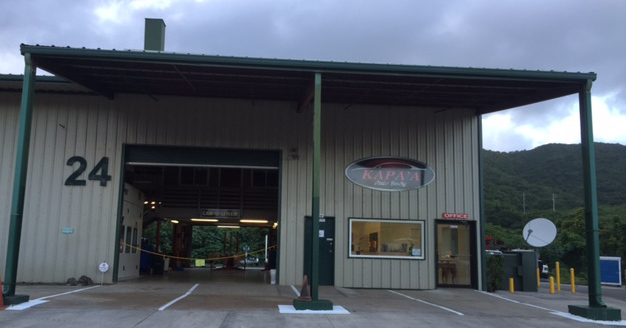 Kapa’a Auto Body provides a calm and welcoming atmosphere. We have a spacious waiting room with complimentary beverages to give you the feeling you aren’t at an auto body shop. We also accept all insurances to accommodate our customers’ needs. Our auto body technicians are I-CAR trained and certified in order to provide our customers with high quality paint and auto body repairs. Kapa’a Auto Body is ASE Certified, and we are currently on our way to the Road to I-CAR Gold. At Kapa’a Auto Body, we are determined to achieve the highest ASE, I-CAR and OEM Certifications. 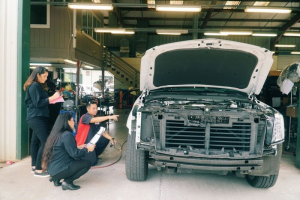 We are proud members of the Automotive Body & Painting Association of Hawaii (ABPAH) who extend collision trend guidance, education and unity for all auto body shops in the State of Hawaii. 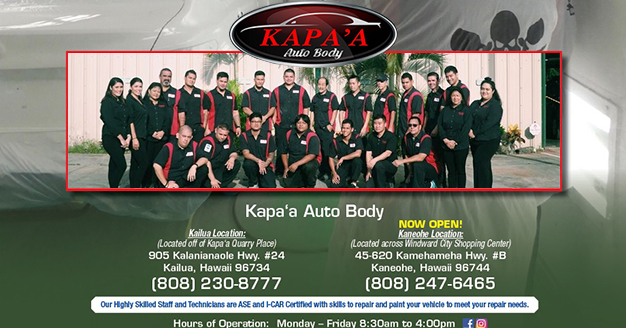 Kapa’a Auto Body is here to serve and provide you with any and all of your auto body repairs and painting. We know it is stressful to need repairs for your vehicle. Our team understands, and because of this, we do our best to take care of every step of the repair process. We serve the following communities from Kailua, Kaneohe, Waimanalo, Hawaii Kai, Kahala, Kahuku, Hauula and even customers over the Pali Tunnel and LikeLike Tunnel. We are within a few miles from the Kaneohe Marine Corps Base and just a few minutes from the H-3 Freeway.